The world didn’t know much about a boy named Sachin Tendulkar. He hadnt assaulted a million bowlers, even his test debut was one and half years ahead, even Ranji Trophy wasnt graced by his presence yet. Season 1987-88 was a purple patch that never ended. 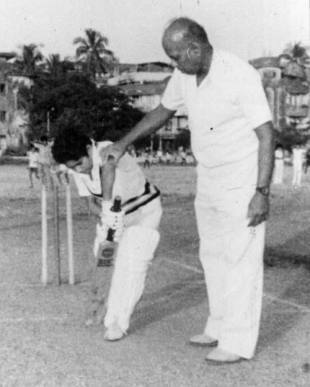 Playing in the Vijay Merchant tournament he scored 130 and 107 and then at the Inter-Zonal stage he made 117 against the champions, East Zone. Then in the Vijay Hazare tournament (for Under-17s) he scored 175 for West Zone against champions East Zone. Then came the avalanche. A 178* in the Giles Shield and a sequence in the Harris Shield of 21*, 125, 207*, 329* and 346*! A small matter of 1028 runs in five innings! And in the course of that innings of 329* he set the much talked-about record of 664 for the third wicket with Vinod Kambli, who, it is not always realised, scored 348*. Perhaps the most fascinating of them all was the innings of 346*. Coming immediately, as it did, in the shadow of the world record, a lot of people were curious to see him bat. Sachin ended the first day on 122, batted through the second to finish with 286, and when the innings closed around lunch on the third day, he was 346*. And then came back to bowl the first ball. In April’s Bombay summer. Another interesting piece about the famous Sachin-Kambli partnership is here. Though I dont care much about cricket or sachin, it is a nice article .. especially the quoted text !!! seems like… people have nothing better to do … then to fan their obsession of Sachin… agreed he’s great…. but still… even if a lil % of this attention is given to other sports and sportspersons we will have much more to cheer about.. then to beat the Sachin trumpet over n over again…..
wtf sainani. You need to know more of him. Comparing Ponting to Sachin is like comparing the size of a lake to a ocean. @Pankaj. Legends always garnered such obessions from fan,…be it Sachin, or Amitabh Bachann or Late Michael Jackson. Diverting fans’ attention to other sport arena…there shud b some “firework” in that area. Fans are anyways followers, they will follow wherever the “attraction” is. @ Pankaj : Whatever you say and do, cricket is the game in India and I don’t think you can blame cricket for doing so.. There was a time when Hockey and football were popular in India, now blaming cricket that it became more popular than them now, wouldn’t be fair on your part. It was almost a chance that india won the ’83 WC, and also the presence of good administrators in Indian cricket. Would you like to tell me, why should i give my attention to those games,if they are not interesting enough for me..
and will continue to remain so. @ Himank : and statements like ‘Sachin on Song’ …. well that’s true for every good batsmen… ‘ Sehwag on Song’ has no other match… ‘Yuvraj on Song’ is truly unparalleled…. with Sachin… there’s more than just his batting… his overall package…. attitude… demeanour on and off the field….. that’s why he’s what he is today ! !